David Didau (@DavidDidau) has used the concept to discuss problems that might come from “Reading Along“. Greg Ashman (@greg_ashman) champions its use because it underlies “Cognitive Load Theory”. Baddeley’s interpretation of Working Memory provides a theoretical underpinning of Meyer’s “Dual Coding” – you learn more from words and pictures – which is all over the place at the moment. It is a straightforward concept – we can only give attention to so much at any one time. It seems clear to me that theories which aim to understand and allow for what could be a major bottle-neck in the cognitive process have real potential to inform teaching practice. In this post I discuss my interpretation of evidence for and the models of Working Memory. Any discussion of their application to theories of teaching will have to wait for a later post. In the 1970s “cognitive science” had begun to influence “cognitive psychology”, and cognitive science is very much about using our ideas about computers to help understand the brain, and our ideas about the brain to advance computing (AI). Those of us old enough to remember the days when computing was severely limited by the capabilities of the hardware will recognise the Cog. Sci. ideas that informed this hypothesis. The limitations of the very small memory which held the bits of information your CPU was directly working on could slow down the whole process (even today, with the great speed of separate computer memory, processors still have “on-chip” working memory known as the “scratch pad”). Equally, a similar limitation will be familiar to anyone who makes a habit of doing long multiplication in their head; there’s only so much room for the numbers you are trying to remember so they can be added up later limiting your ability to perform the task. As such the limited Working Memory idea has instinctive appeal; the WM is limited, the LTM is not, but the LTM is not immediately accessible. Who knows, a model such as the one Baddeley speculates about above might even provide a theoretical basis for learning styles! 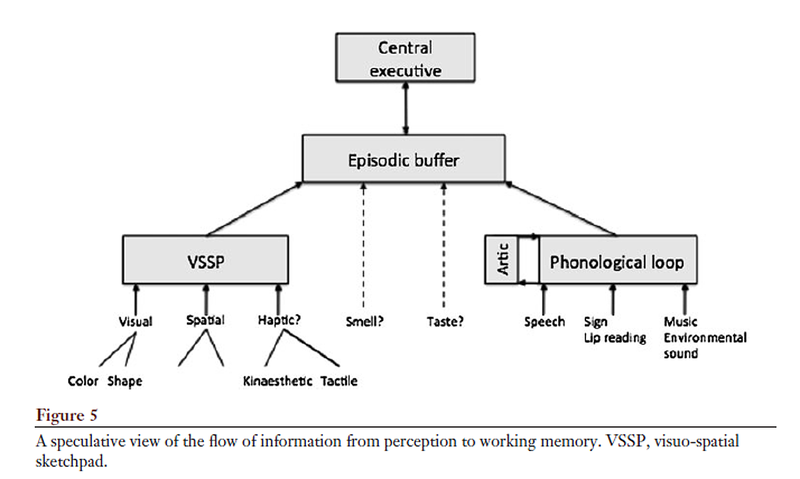 Experimental studies into Working Memory generally take the form of exercises whereby a task such as correcting grammar or doing sums is used to suppress rehearsal. If you are doing something else you can’t be repeating what you need to remember over and over. Subjects are then tested on how many letters, words, numbers, shapes, spacings they can remember at the same time as doing this second task. The number varies a little with the task and with the model the researcher favours, but 4-7 is typical. Experiments find working memory capacity to be consistent over time with the same subjects, and reasonably consistent when the mode of the test, language rather than maths, for example, is changed. The consistency of Working Memory Span Task outcomes and the breadth of skills that they correlate with strongly indicates that something important is being measured. That there is a limit to “working memory” seems hard to question. My reading has not led me to lots of evidence that there are two different and separate registers (Visuo and Phonological), but that may be a consequence of my paper selection being skewed by the firewalls that restrict access to research. 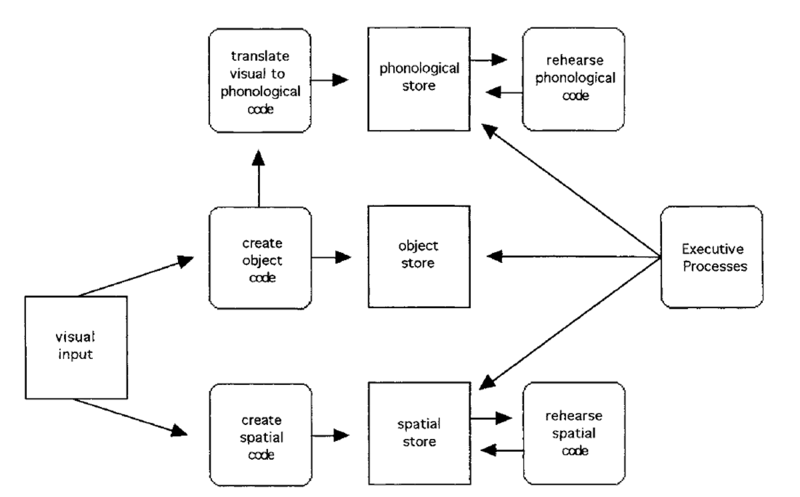 Cowan’s model is at the lower end for the number of items that can be stored in the working memory – four, but as Baddeley says “Importantly, however, this is four chunks or episodes, each of which may contain more than a single item“. i.e. WM is likely central to learning. What Cowan’s model does not include is any suggestion of different registers for different kinds of information. This may, however, be because his work is about focus of attention, not memory structure. “1. The activated part of long-term memory can serve, among other things, to memorize information over brief periods for later recall. The region of direct access holds a limited number of chunks available to be used in ongoing cognitive processes. A 2014 paper, suggests current thinking is that a better fit for experimental data might be WM as a limited resource that can be spread thinly (with more recall errors) or be more tightly focussed, rather than as register with slots for somewhere between 4 and 7 things. I suspect that if this turned out to be the case it would not much bother Oberauer because it may be no more than the oval in his diagram being drawn tighter or more widely spread. This change brings Baddeley’s model much closer to Cowan’s. Both have an unspecialised, four slot buffer or register, each slot (according to Baddeley, in both models) capable of holding more complex ideas than just a word or number, or as Baddeley puts it “multidimensional representations”. 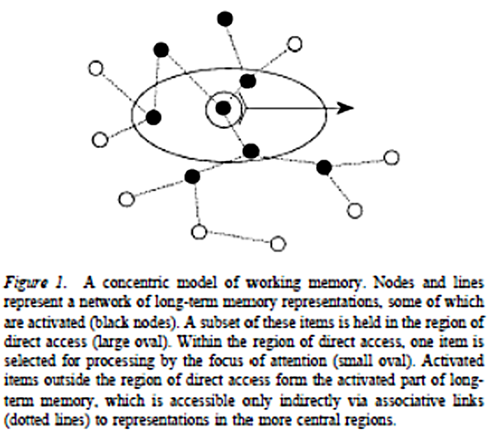 Baddeley regards this as a separate entity to the long term memory, and individual differences presumably follow from differences in the architecture of this entity, where Cowan sees it as an activated portion of the LTM and individual differences stem from differences in the ability to maintain focus on this activated area despite cognitive distractions. The evidence for working memory being restricted is convincing. I have to say that my reading has me less convinced that working memory encompasses “multidimensional representations”, because all the evidence that I’ve seen has been for the retention of words, shapes and numbers. I am more drawn to Cowan’s and in particular Oberauer’s model and like the idea that the differences these memory span tests show up are differences in focus rather than memory architecture. I don’t think I would be misrepresenting Conway (lead author on a couple of papers referenced here and a co-author with Cowan) in saying that he regards an ability to focus on what is important, in the face of requests to your internal executive for cognitive resources to be diverted elsewhere, is far more likely to correlate with all the intellectual skills that WMC has been shown to correlate with, than having one more space to remember things in. 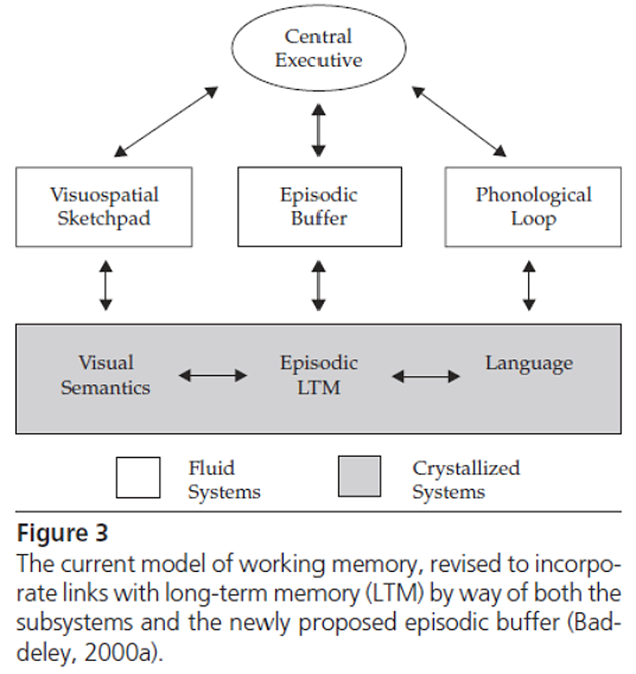 Cowan’s model and Baddeley’s revised model downplay the structural differences in different forms of short term memory linked to different senses, in favour of a more generalised but limited tool that has direct links to Long Term Memory.